RV Bike Rack – What’s The Best Bike Rack For Your RV? Bicycles and RV’s go hand-in-hand, but which RV bike rack should you buy for your particular rig? 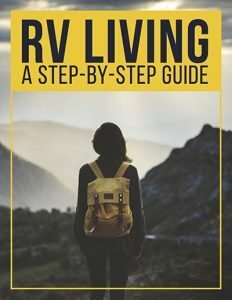 In this article, we will take a look at the numerous options, available to RV owners. Together, we will discover the right RV bike carrier for your personal needs. 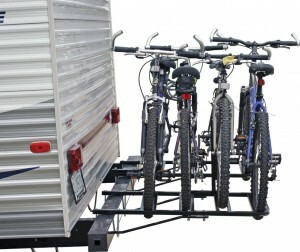 Choosing an RV bike rack is all about correct compatibility. If you own a bike that doesn’t fit your bike rack, or a bike rack that doesn’t fit your camper, you are in trouble. The key to finding the right fit is due diligence. Ask questions. Consider your options. Read the online reviews. If you take the time to study your bike carrier options the first time round, you won’t ever have to think of it again. So, let’s start this article by asking nine questions that help determine that perfect RV bike rack. 1. How many bikes do you plan to carry with you? 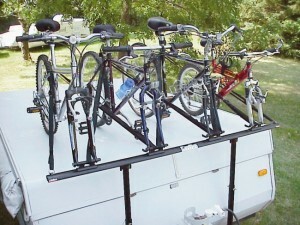 The average RV bike carrier will hold two to four bicycles. However, there are single bike mounts for RVs, as well as mounts that will hold a total of six bikes. Knowing how many bikes you will carry, immediately narrows your choices (and make choosing a whole lot easier!). 2. Do you have a roof ladder on the back of your rig? Ladders are often used for attaching bicycles. This is the easiest way to quickly mount and unmount your bike. 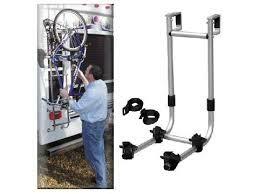 If you choose a ladder RV bike mount, be prepared for it to carry only two bicycles. Ladder mounts are easy to assemble and fit on almost every style of ladder. The biggest challenge with this type of mount is the height. Upper body strength is definitely required. 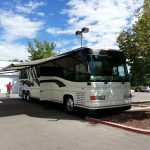 If you don’t have a ladder on your RV, then you can move on to other types of bicycle racks for RVs. 3. Do you have a square bumper? A square, one piece bumper is the most popular place to mount a bike for your RV. Bumper mounts are supported by two arms with cross bars. Bicycles sit between the cross bars, and provide relatively easy removal. In general, bumper racks are a simple choice, however, it is not uncommon to struggle to secure the bikes. Also, remember that the cycles will add weight, and possibly height, length or width, to your overall unit. 4. Do you have room to add a hitch mount? 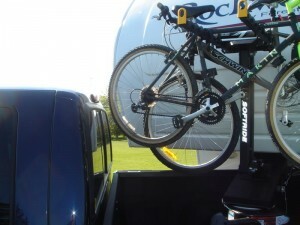 A hitch mount is a unique RV bike carrier, for up to three bikes. 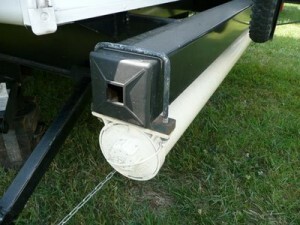 Hitch mounts are very easy to connect and can be transferred from your RV onto the back of a vehicle, with ease. Hitch mounts offer the widest variety of bicycle options in the RV market and make the bikes easy to get on and off. 5. Do you have a spare tire on the back of the RV? 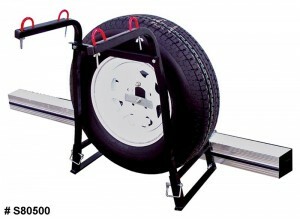 Spare tires can be used for an RV bicycle carrier. This is a popular choice for campers, pop-up trailers, fifth wheels, and trailers. The rack fits over, or around, the spare tire, and connects to the bumper/frame. The biggest problem with this type of RV bike rack is the added length. If you already have a 39-foot fifth wheel, you may not want an additional three feet of length (bringing you to a total of 42-feet). 6. Will you be accessing your bicycles often or just once in a while? If you use your cycles often, you will want easy access. If you rarely use your bikes, you can choose a higher mount that keeps them out of the way. Bumper, hitch, or spare tire mounts make it simple to get your bike on and off. Ladder and roof mounts are higher, and thus more challenging to access. Consider the intended usage before purchasing your rack. 7. Are your bikes the same size and style? Some bike racks are adjustable, and others are permanently fixed. Be sure to know what size, and style, of bicycles you plan to carry. Some companies (like Walmart, Amazon, and Costco) offer an easy exchange on products, just in case you change your mind. 8. Who will mount and remove the bikes? Believe it or not, size matters when it comes to RV bike racks. Ladder racks work great if you are tall, but are frustrating for those of us who are closer to 5′ or less. Bumper mounts are easy to unhook but may provide less security. Determine which feature is most important to you and plan ahead. 9. Wheel mount or frame mount? Yep, there is a difference! Knowing which style or mount you want to use, will help you choose the correct rack. A bumper hitch will allow you to choose a frame mount or a wheel mount. Ladder racks usually connect to the wheels. Spend some time looking at online photos, to see which style would work best on your motorhome, camper, or fifth wheel. 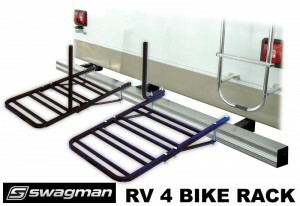 Ladder– The Swagman RV Bike Rack is one of the most popular in this category. Most users suggest using a bit of padding between the bike and the ladder rungs. Many use bungee cords for additional security, although many of the Swagman racks come with Velcro straps. Remember, ladder bike racks are usually designed for only two cycles. Bumper– Swagman makes both a two-bike and a four-bike carrier for the RV. As a bumper carrier, you can mount your cycle by the frame or the wheels. Be sure to look at the options and measurements, to make sure your bicycles will fit together without hitting each other. Hitch – Swagman makes a four-bike bumper mount that works with the hitch. They also sell hitch adapters, which allow you to choose a wheel mount or frame mount, for up to 6 bikes on the back of your rig. Popular accessories – While an outside bike rack is convenient, the weather is not. Be assured that rain, mud, and snow will cling to your cycle, just like they cling to your RV. The easiest way to avoid the hassle is to purchase a bike cover. Many bike covers will accommodate 2 or more cycles, keeping your ride clean and dry. Velcro straps, bungee cords, duct tape, and neoprene are all popular ways to secure your bicycle. If you are concerned about bike security, you may also want to invest in a lock and chain for each cycle. 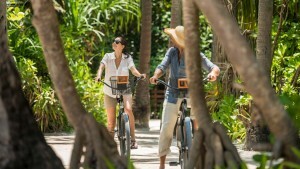 Another popular option, in the RV community, is the folding bicycle. Folding bikes have been available for many years, yet many people have never heard of them. A folding bike is affordable (often costing less than $200) and relatively light (weighing less than 35 pounds). 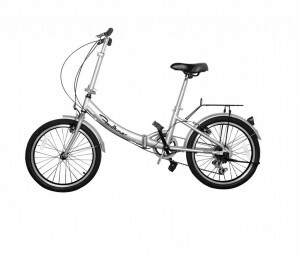 Stowabike is a popular folding bike that has rave reviews. Folding bikes require some basic tools, and a bit of know how. Once you learn to fold them, it’s easy to repeat the process again and again. RVers who travel with folding bikes do not always need an RV bike rack. Folding bikes can be placed on the roof, in the basement storage, or even inside. 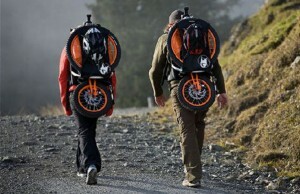 Believe it or not, there are even backpacks designed to carry folding bicycles while hiking. Folding bicycles come in both 20-inch and 26-inch heights, and the old fashioned one gear style, or as a mountain bike. You can purchase a folding bicycle from Camping World or Amazon, in a variety of styles and colors. Some RVers use their tow vehicle for their bikes. If you are using a tow vehicle, you may be able to use a roof or grill rack (or even place the bikes in the back of the vehicle.) Owners of travel trailers will sometimes mount bikes between the front of the trailer and the back of their truck. Diesel motorhomes can even mount a couple of bikes to the front of their rig (though this is not a popular choice). Once you answer the questions presented in this post, you will know which RV bike rack (or bike) is right for you. Your next step is shopping. Consider spending 20 minutes, or more, surfing online and reading the top reviews. 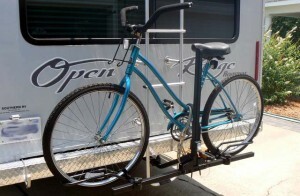 Happy and unhappy customers often post their challenges and adaptations to a particular RV bike carrier. Be sure to read the return policy before making your purchase. Even the best researcher can need to return something, so always buy from a store with a great return policy. If you’d like to see the rack in person, try visiting a Camping World store in the spring and summer. (They always offer a great selection at this time of year.) Whatever you decide, remember this: the goal of owning an RV and using a bicycle is to have fun! Don’t complicate the process, keep it simple and enjoy the ride.